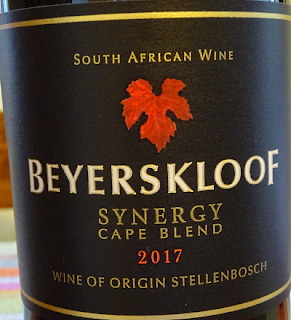 My Wine of The Month for March is Beyerskloof Synergy 2017 WO Stellenbosch. I enjoyed many superb wines in the Cape during March. De Waal's Top of the Hill 2015, especially when tasted in the vineyard, Vin de Francois 2017 at its launch, Neethlingshof ‘Owl Post’ 2017, Delheim’s ‘Vera Cruz Estate’ 2016 and ‘Vleiland Vineyard’ 2015, Môreson ‘The Widow Maker’ 2015, Flagstone ‘Writer's Block’ 2016 and Lanzerac ‘Pionier’ 2014 to mention but a few. So why Synergy? It was a revelation. It is a wine I thought I knew well, and one I’ve oft bought back home at Sainsbury’s supermarket. But this 2017 vintage wine in the Cape is a blend of six varieties. 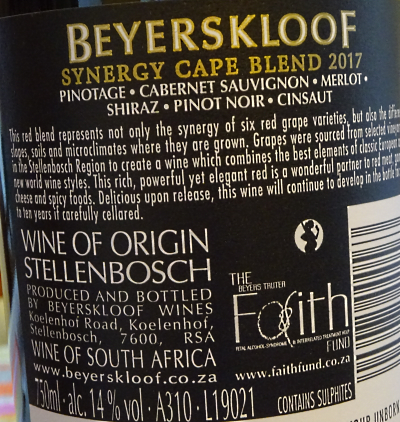 To the usual trio of Pinotage, Cabernet Sauvignon and Merlot is added Shiraz, Pinot Noir and Cinsaut. And what, apart from the taste, makes it so desirable to me, is that I found that I can’t buy it back home. When I made a special journey to Sainsbury’s they had Beyerskloof Synergy 2017 but this is a different bottling. It differs in having only the first three varieties and is WO Western Cape. 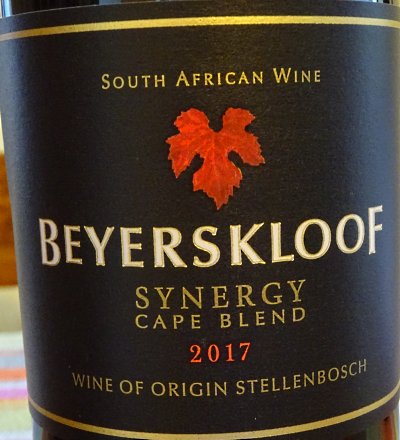 So Synergy 2017 WO Stellenbosch it is, with its fresh brambly fruit and spicyness and underlying structure. Completly satisfying.